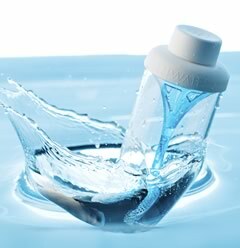 We bring you 321 Water in South Africa, the most beautiful and stylish way to filter and drink tap water on the go. 321 Water is a style and design-centred answer to bottled water – not only distinctive and beautiful to look at, also brilliant in its function. Designed and made in Australia, this high quality reusable water bottle (BPA free) incorporates an award-winning unique plunge filter mechanism, using activated carbon, for filtering and drinking tap water on the go. The brand was created in response to the growing demand for a stylish, environmentally friendly and reusable water bottle. What sets this product apart beyond quality, is the fact that the water is filtered instantly (rather than as you drink), and is drunk free flow out of the bottle rather than having to be squeezed. Unscrew the lid, pull out the filter, fill with tap water, plunge the filter, screw the lid close... then unscrew the cap and enjoy freshly filtered and great tasting water! 321 Water makes drinking water stylish, healthy, green, trendy and fun…and it makes tap water taste even better! To stock this brand or for any related enquiries or questions, please don’t hesitate to get in touch with us, using our Contact Us page. HOME | ABOUT US | OUR BRANDS | STOCKISTS | CONTACT US | COPYRIGHT © 2013.